UMASH staffers, Diane Kampa and Carol Peterson, kicked off the farm show season with Farm Technology Days. This show was held July 10-12, 2018 near Marshfield, WI and gave us the opportunity to work in tandem with our National Farm Medicine Center (NFMC) colleagues. 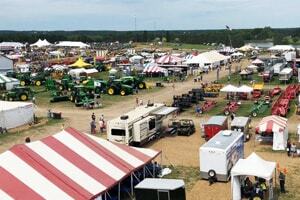 Farm Technology Days averages over 40,000 people in three days. We were located in the Farm Safety and Rescue tent, which allowed us to promote our safety information in addition to the safety demonstrations (grain bin rescue, tractor roll over rescue, PTO safety and tractor roll over demo). We also highlighted the Rural Firefighters Delivering Agricultural Safety and Health (RF-DASH) program for fire departments in need of training specific to farms. Our outreach efforts included sun safety, tractor safety, heat illness and positive animal handling. We used this opportunity to reach both youth and adults and encouraged attendees to look at our website for more information on training videos, fact sheets and research based information for school projects and papers. Farm Technology Days and the upcoming farm shows allow us to connect directly with the farmer, farm family and farm workers. We are looking forward to engaging the agriculture community this summer by bringing safety and health information right in the neighborhood.